Temperature never got above 4C (40F), and we even had a few snowflakes as we climbed the Fire Tower Trail. Starting out on Swift Run Trail. Lots of fern and fungus. Doesn't look like a trail, but it was actually easy to follow. 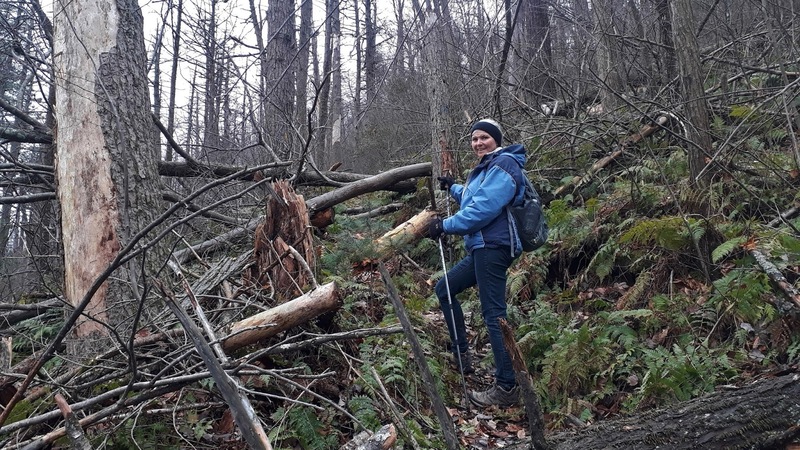 Lots of trees down up here! When we got to the fire tower, it wasn't there any more! We were hoping we would be able to get up there for a view, but all that remained was four concrete slabs. I did some research when I got home. 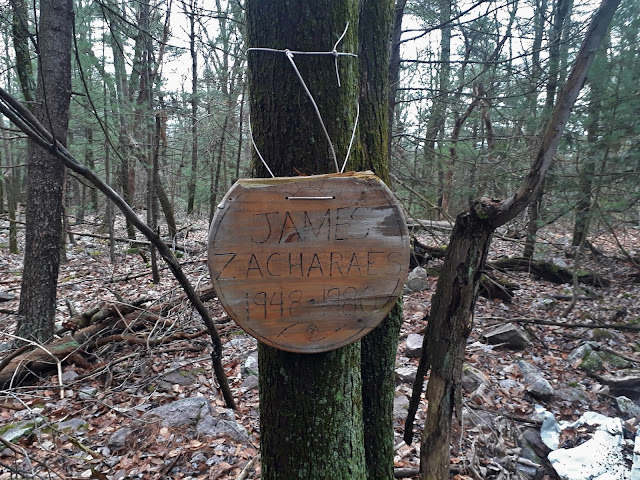 Very little reference online, but apparently this 32 year old lost his life in a single engine plane crash back in 1980. 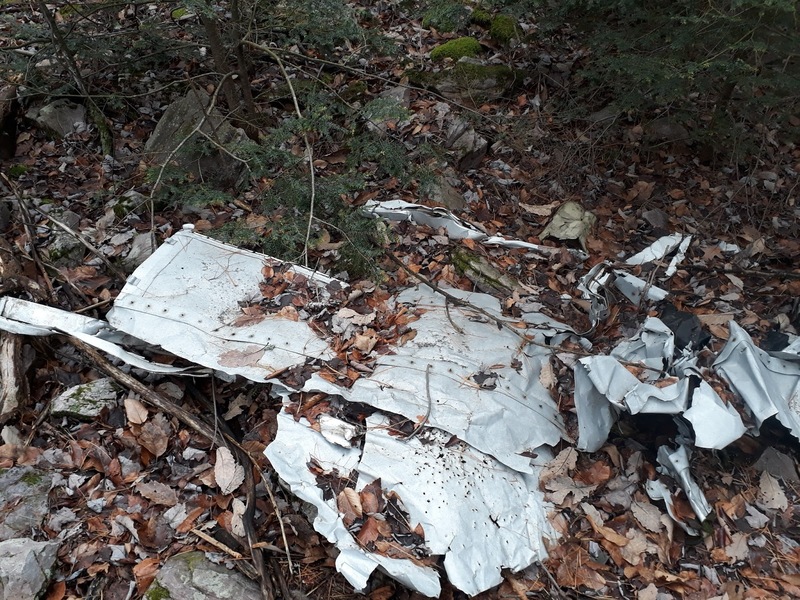 Barry and Connie have been living here there whole lives, and Barry says he vaguely remembers something about a plane crash on the mountain a long time ago. There are still parts of the airplane lying there. In Bald Eagle State Forest. We did about 4.5 miles (6 kms). Not long, but we were out for about two hours. Went back to the house and watched some of the last Nascar race of the season. Barry is an avid hunter, and so they have lots of venison in the freezer. Ruth was going to make a spaghetti sauce, but changed her mind to chili at the last minute. We didn't know how it was going to turn out with ground venison, but boy was it ever good. Probably the best chili I've ever had. We all agreed! After dinner, we enjoyed hearing stories from Barry's racing days. 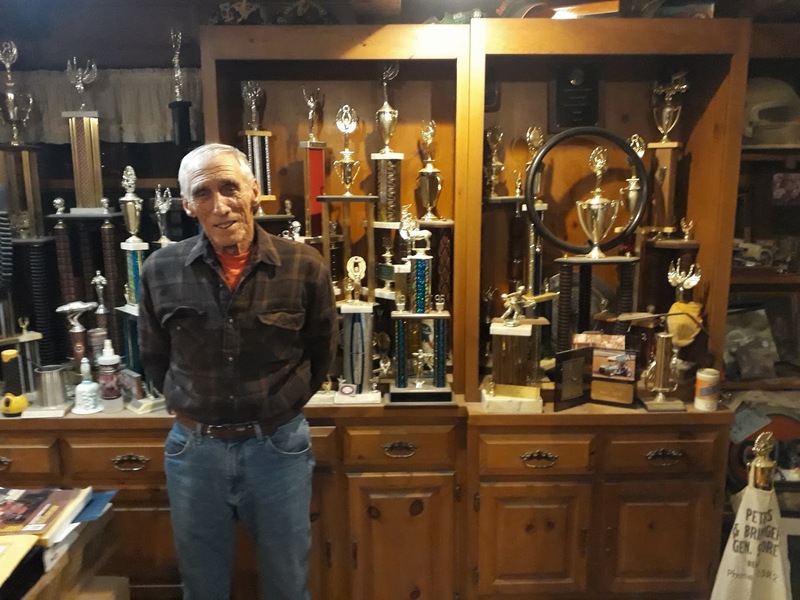 He was a well known sprint car driver in these parts and if any of you followed the circuit back in the 1970's and 1980's up and down the east coast race tracks you would recognize the name Barry Camp. Barry Camp and trophies from many races! 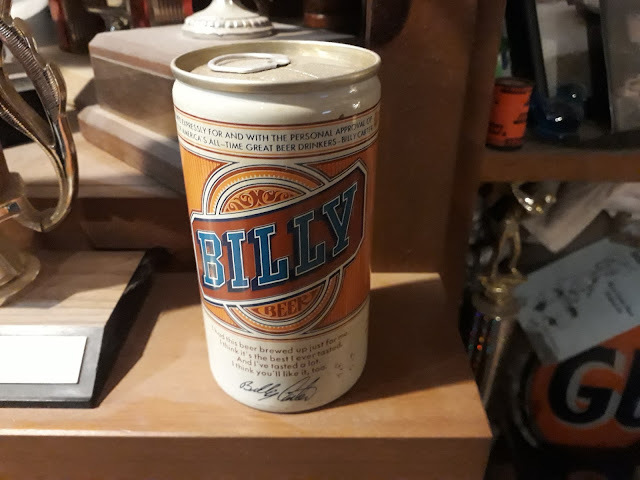 I noticed an unopened can of Billy Beer on the shelf! Another great day staying with Connie and Barry. But, as a good friend of ours says... "House guests are like fish... after three days they start to smell". Too funny. Have you heard of Sous Vide cooking? Here is your chance to try it out! You had a nice visit there and the to head on down the road. We have venison many times and cooked the right way it is awesome. We had a wonderful visit but yes, we are looking forward to new scenery and new adventures ahead. Looks like good hiking country and hasn't been beaten down by a lot of tourist feet. Creigh has peaked my interest in Marietta, Ohio; I knew I had heard that name before. Somewhere in the Marietta vicinity are some large complex mounds which have been dated before western Europeans crossed the Appalachians. At first, it was assumed they were burial mounds of Native American Indians, but that now has been discounted. To this day, no experts have been able to fill that gap as to where they came from; it is speculated that another civilization existed there before the Native American Indian. We may never know as so many of the mounds have been destroyed since the European migration. If you and Ruth are out hiking, you might keep an eye out for one. I'm sure the information center in Marietta might be able to tell you a particular location. Mexico seems to protect and preserve their ancient past better than the US does. It is a great hiking area. Not sure how busy it is in the summertime though, I would expect that it is popular enough. We will have so see where these mounds are located, they might be interesting to see. Ahhh, thanks Connie and Barry! You were wonderful hosts and we really had a ball with you both. What a great hike! Love the pics. Venison can be very good, although I prefer venison burger to a roast or steak. It's more versatile. Nice to visit but nice to get on the road again too. It was a beautiful hike, especially along side the creek because of all the moss and ferns. It must be fantastic there in the summer when all the leaves are out. I agree, I think we would prefer the ground venison to a roast or a steak. I think it is the first time since being in Africa that we have had game meat, and we certainly had some different kinds there. Some were stronger tasting than others. Have a good time in Florida this next week. Guess what - our flight is delayed until tonight - now we know how you felt on the first travel day!! Awww...that's not fair! :-( Hope you made it there fine otherwise. Yep, that is for sure but Canada isn't really that far behind!